Sometimes referred to as “living fossils,” their ancestry dates back 450 million years. FOUR HUNDRED. FIFTY. MILLION. You read that right. In that time, the crabs haven’t changed all that much, hence their nickname. Horseshoe crabs have blue blood. According to the Wetlands Institute, “Their blood contains a clotting agent, LAL (Limulus Amoebocyte Lysate), which provides a fast, reliable test for the presence of infections bacteria in drugs, as well as prosthetic devices such as heart valves and hip replacements.” So, aside from being a really cool color, the blood extremely useful to us humans. The crabs can be bled and returned to the ocean with minimal mortality. Horseshoe crabs spawn like clockwork from May-June which just so happens to be the same exact time migratory shorebirds are passing through, some traveling over 9,000 miles! The Delaware Bay serves as their pit stop and horseshoe crab eggs are their fuel. Without the horseshoe crabs, these birds (some threatened species) would not have the energy to make the trip to their nesting grounds in South America. So, here comes the activity! Just Flip ‘Em. That’s it. All you have to do is find a beach on the Delaware Bay from May-June and help stranded horseshoe crabs by flipping them over and getting them back to the water. Many end up on their backs during spawning season and will never be able to flip themselves over on their own. This is such a great citizen scientist opportunity and a great way to teach kids about the importance of one creature in the grand scheme of things. Even little ones can grasp the concept of saving a life and how good it feels to do so. Also, it’s a good confidence booster. I thought D would be terrified of horseshoe crabs because he’s got a lot of sensory sensitivities and heightened fear responses, but he absolutely LOVES flipping crabs. He gets so excited every time he spots one in need and is so proud of himself for helping the crab get back to the water. 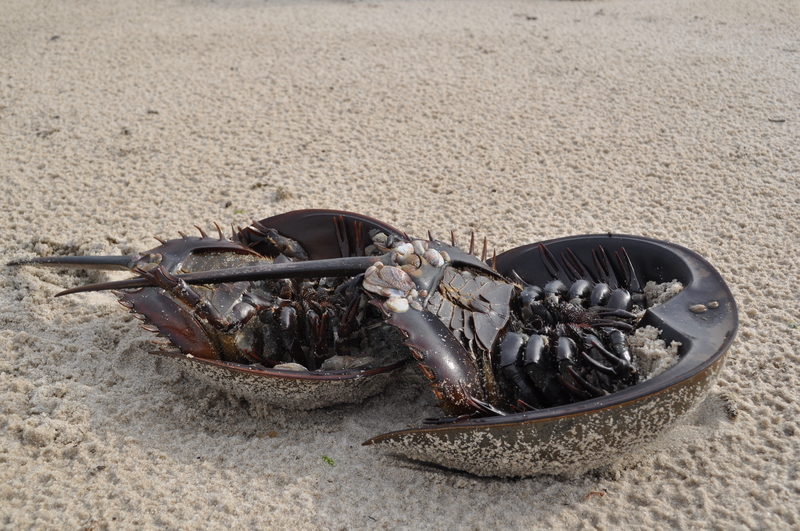 If you’re not too familiar with horseshoe crabs, and may be a little scared of them yourself, don’t be! They are harmless. They aren’t actually crabs, and can’t pinch or bite. Their tail is used for steering and righting themselves and is very delicate, so do not pick them up by it. I usually hold on to either side of their shell or hold them upside down while carrying them. DNREC offers some great tips for viewing and flipping crabs including where to go and what to wear. If you have older kids or teens, you can take it a step farther and participate in horseshoe crab spawning surveys and tagging. Data collected from volunteers annually helps scientists track the horseshoe crab population and health of the ecosystem as a whole. They can then enacts bans on commercial harvesting as needed to protect the population, and in turn the populations of migratory shorebirds. It’s a great experience to have as a family every year and you will be contributing to overall ecosystem wellness by providing just a little bit of your time.